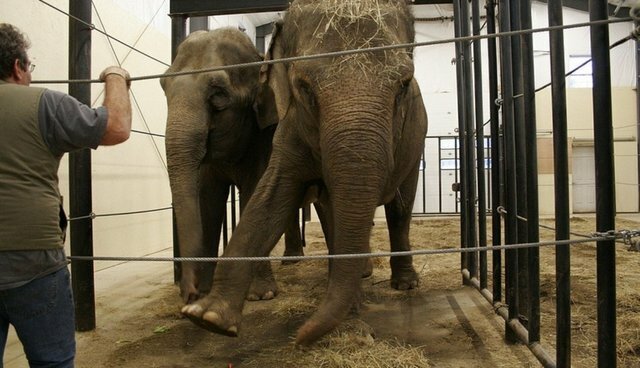 Is There Any Hope For These Two Retired Circus Elephants? Dodo Contributor: Christina Russo is a freelance writer and writes primarily about animals. What is going to happen to Rosie and Opal? This is a nagging question for those who are following the tale of these two female elephants. 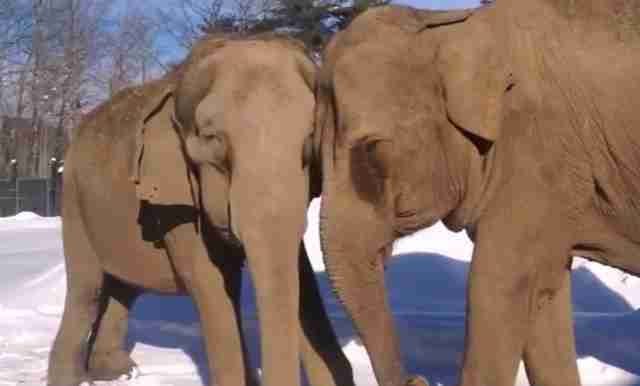 Since 2012, Rosie and Opal - a pair of middle-aged, retired circus elephants - had been living at Hope Elephants, a facility in Hope, Maine. Jim Laurita, veterinarian and former circus elephant trainer, was the non-profit's founder and he lived by Hope's mission "to provide a unique and caring home for injured and aging elephants." But Rosie and Opal's storyline took an unexpected turn in the early morning of September 9, when Jim Laurita was found dead in Hope's elephant paddock. (Video Still: Youtube/JimLaurita) Rosie and Opal in Hope, Maine. Although there were no witnesses, officials believe Laurita fell and hit his head on the paddock's cement floor - and one of the elephants, in an effort to save him, inadvertently crushed him to death. "The elephant was not aggressive in any way. It was clearly an accident," said Mark Belserene, administrator for the state medical examiner's office in an AP article. Soon after Laurita's death, Hope Elephants' Board of Directors wrote a Facebook note explaining that Rosie and Opal would be returning to their original owners: the Endangered Ark Foundation (EAF) in Hugo, Oklahoma. Rosie and Opal had been living there after they were retired from Carson & Barnes circus. Laurita leased them from EAF and moved the pair to Hope in 2012. "They are adjusting very, very well," says Copeland. "They have come back home and are familiar with their element and environment. I was there the day they arrived and they really are fascinating. They greeted each other and there was trumpeting and rumbling and they locked their trunks." Copeland describes EAF as a 200-acre circus elephant retirement facility Although Copeland says EAF doesn't explicitly breed its elephants, she also says that one of the males provides "stud service" and the fee goes back to the EAF. Although Copeland stresses that EAF and Carson & Barnes circus are "separate entities" there is a significant amount of overlap between the two organizations. EAF was established in 1993 by D.R. Miller and his wife, Isla; the Millers are the founders of the Carson & Barnes circus. They are situated on the same exact street in Hugo. All but one of the elephants currently residing at EAF are former elephants of Carson & Barnes circus, according to Copeland. Moreover, 2013 tax documents show the listed board members of the EAF include top officials at Carson & Barnes. Lastly, the USDA confirms it does not have a separate inspection license for EAF: it falls under Carson & Barnes. It is this close relationship between Carson & Barnes and the EAF that has some animal welfare advocates particularly worried about the future for Rosie and Opal. Especially since the USDA has cited Carson & Barnes for violating the Animal Welfare Act; a list of its AWA violations can be found here). Born Free USA has a page dedicated to Carson & Barnes' "failures." In Defense of Animals also targets Carson & Barnes for its treatment of elephants, highlighting that it "routinely tears elephant babies and mothers apart." Brittany Peet, counsel for the PETA Foundation, sees very little distinction between the two organizations. "Elephants who live at the Endangered Ark Foundation are not carted from town to town as the elephants in Carson & Barnes," Peet adds, "but this is not a retirement facility ... elephants at EAF are still chained and still handled using direct contact. They are never without bullhooks." Direct contact is a training method commonly used in circuses and some zoos. In direct contact, there's no barrier between the handlers and the pachyderms, and the handlers sometimes - but not always - use what's called a bullhook to train the elephants (a bullhook looks a bit like a fireplace poker). Opponents of the bullhook often refer to it as a tool of abuse; defenders consider it a guide. By all accounts, Jim Laurita did not use a bullhook at Hope Elephants. "We absolutely use an elephant guide," says Kristin Parra, the road officer manager for Carson & Barnes. Parra's family owns Carson & Barnes and she spoke on the phone during a circus tour. "The guide is an accepted tool that has been used with elephants for thousands of years. It is a guide to move the elephants toward you - or away from." She adds: "We have to have some means to maneuver the elephants and control their movements." (Video Still: Youtube/JimLaurita) Rosie in Hope, Maine. Parra says the notion that any of the elephants at EAF or Carson & Barnes are being mistreated is absolutely false: "I can assure you that all of the animals of both Carson & Barnes and the Endangered Ark Foundation - even though they are two separate entities - the elephants are not being beaten or abused. They are loved and vital part of our family. That I can say without hesitation." Catherine Doyle, Director of Science Research and Advocacy at Performing Animal Welfare Society (PAWS), a wildlife sanctuary in California that is home to three former circus elephants, says Carson & Barnes is "known for its abusive tactics" and nods to an undercover video shot by animal welfare activist Bryan Monell at Carson & Barnes in 1999 as a particularly explosive scene. Monell now works at Farm Animal Rights Movement (FARM), but says he worked undercover for PETA while being employed as an elephant groom at Carson & Barnes intermittently from 1998-2002. "My job was to move the tubs around during the [elephant] training session, to clean up and to pack [the elephant's] bleeding wounds during sessions," he wrote in an email. Most people, he says, didn't have access to the training sessions, which occurred behind "the famous black door." "The life of the circus elephant is ... inherently abusive," he says. "Elephants in the circus are constantly being chained up in trucks or on concrete floors or windowless barns. They are beaten with bullhooks, baseball bats and fists. I have seen elephants jabbed with pitchforks." He adds, "The trainers were smart enough to beat the elephants in the trucks late at night or behind the scenes after the public had left." Monell claims he worked with both Rosie and Opal during his time at Carson & Barnes: "Rosie was very sweet. It's a cliché, but she really is a gentle giant." 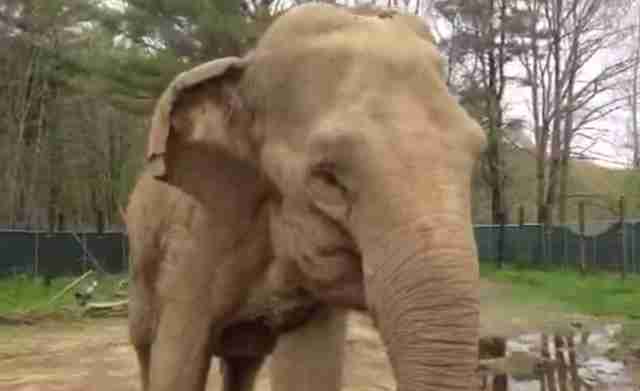 According to Monell, the two elephants worked regularly: "Rosie was crippled on her front leg so she didn't really perform all of the tricks," he notes. "She was used mainly for giving rides, which happened pretty much every day. Opal worked every single day, as far as I remember." Both Rosie and Opal, he says, "endured countless beatings" at Carson & Barnes. In an affidavit supplied by Monell, dated February 2002, he is quoted describing one session where an employee shocked Opal 171 times with with a hotshot device - similar to a cattle prod - all over her body, including left rear leg, left foreleg, trunk and face. "This occurred," the affidavit reads, "over only a couple minute span." Kristen Parra at Carson & Barnes outright dismisses Monell's years-old claims. "I don't believe this incident ever took place." She says, "I have heard about this affidavit. But if you are standing there and witnessing it - why aren't you going to get someone? Why would you stand there! That makes no sense to me at all!" she notes, incredulous. "I think he is a disgruntled employee." Monell maintains that when the video was released, circus employees threatened him and he was chased out of Hugo. He says watching the story of Rosie and Opal is heartbreaking: "[While undercover] I gave each and every one of the chained up elephants a hug, looked each of them in the eye and promised them I would free them one day. I have failed miserably because they are still there. This has been one of - if not the biggest - failures of my life." "People" he says, "have no idea how bad it really is." As for the elephant trainer who allegedly shocked Opal 171 times, Parra says he does not work for Carson & Barnes anymore. *** Meanwhile, back in Hope, Maine, messages continue to build up from local residents on the Hope Elephants Facebook page - complete with emoticons and plenty of punctuation. "We miss them so much!!!" says one poster. "Wishing nothing but the absolute BEST," writes another. "Miss, miss Dr. Jim, the girls, and the hope they provided..." There's also a string of invitations for a "Dr. Jim Happy Hour" - in honor of the late and clearly beloved Hope Elephant founder - Jim Laurita. The idea to bring Rosie and Opal to Maine in 2012 was a joint decision between Laurita and EAF, says Parra. Laurita was an elephant trainer at Carson & Barnes in the 1970s and according to EAF's website, Laurita had a long time friendship with EAF's board members and the two organizations had "like-minded" missions. Parra explains: "It's not that he wanted [Rosie and Opal] and we said: ‘Take them!' He had come up with new medical treatments and new acupuncture and hydrotherapy treatments that hadn't been used and tested." EAF was very excited by this idea, says Parra. She says the ultimate goal is to implement the new modalities on other elephants in Hugo and facilities elsewhere. According to Hope Elephants, both Rosie and Opal suffered numerous ailments from their period in the circus. Rosie has a litany of problems: arthritis, gait issues and a partially paralyzed trunk that forces her to toss food and water into her mouth. The site goes on to explain that Opal "suffers from limb and joint deterioration and requires physical therapy to alleviate some of her pain and discomfort." Carol Bradley, a longtime journalist who recently wrote a book on circus elephants called Last Chain on Billie, says many elephants suffer not just physical, but psychological stress from working in the circus. "They can have the equivalent of PTSD. They have been in chains for so long. They bob their heads back and forth. They swing their legs back and forth." Not everyone embraced the original and arguably laudable goal to give Rosie and Opal special medical attention; the proposal to bring the elephants to Hope spawned a response from a number of welfare groups and elephant experts including PAWS, PETA and In Defense of Animals (IDA). Catherine Doyle was the elephant campaign director at IDA when she first heard that Laurita was lobbying to house Rosie and Opal: "One major concern we had at that time was the welfare of the elephants. The elephants were to be kept in a small area (the facility had only one acre of outdoor land), and due to the winter temperatures, they would spend much of the year indoors." There was also the concern that Laurita would be using the direct contact method (numerous attempts to speak with Hope Elephants were not immediately returned). Doyle wrote letters to the USDA expressly highlighting safety concerns. When Doyle found out Laurita died in September, she said she was sad - and angry: "He didn't have to die," says Doyle "If he had used protected contact he would be alive today. It is such a tragedy. It did not have to happen." Protected contact is the alternative to direct contact. It keeps a constant barrier between handlers and the elephants and experts say it relies on positive reinforcement in the management of the elephants. PAWS and other organizations espouse the protected contact method. "I think [Laurita] actually had good intentions," Doyle continues. "But unfortunately, I think he was naive about what he was doing. The medical examiner made a statement saying that he fell and hit his head and an elephant ‘accidentally' stepped on him." But, Doyle says she's not sure that's an accurate assessment, since there were no witnesses. "It's highly unlikely the elephant accidentally stepped on him: elephants don't do that. [Laurita] was probably very kind to Rosie and Opal, but they were psychologically scarred by their captivity. They were forcibly taken from their families as babies. Shipped across the world. And then violently trained and used in circuses." (Taking elephants from the wild was how circuses originally acquired many of their elephants. According to the online Absolute Elephant Information Encyclopedia and Database Rosie and Opal were both seized from the wild: Rosie was captured in Asia in 1970; Opal was captured in 1969 from India. Journalist Carol Bradley says that over the course of her research, several people told her that elephants have the capacity to experience a lot of their trauma. "And you don't know when it is going to come out. They don't forget. They can lie and wait and they will get back at their perpetrator or lash out at an innocent bystander. They can suddenly lose it." The circus, she says, used to be such a fun piece of Americana. "But we've learned so much more about elephants in the last 30 years. How intelligent they are. How family oriented they are. In the circus, home is performing, on the road, all the time. Home is the back of windowless truck - and chained. There is nothing about elephants' lives in the circus that is natural. And we know too much about elephants now to accept that." Currently, OSHA is investigating whether or not direct contact was a contributing factor in Dr. Laurita's death; Karen Billups, an official of OSHA in Maine, says a determination should be made within six months. Some animal welfare groups are calling for Rosie and Opal to be transferred to an "official" elephant sanctuary like The Elephant Sanctuary in Hohenwald, Tennessee. The Elephant Sanctuary - which has 2700 acres - released a statement saying it "would be pleased to discuss the option of sanctuary with the EAF\Carson & Barnes, as well as the Hope Elephants Board of Directors, so that all concerned parties might collaborate on plans for Rosie and Opal's future." EAF, however, says Rosie and Opal will definitely not be going to Tennessee. Copeland says there will most likely be a future discussion about whether Rosie and Opal might one day return to Maine. In the meantime, Carson & Barnes' Parra maintains Rosie and Opal are receiving excellent care in Oklahoma. "Rosie and Opal are adapting very well since this was their home before they went to Maine. Our head veterinarian is the head veterinarian of the Tulsa Zoo. She has examined them and is going over things. It's not to say their medical routine will be exactly like Hope because they were under the care of Jim Laurita. Now that they are under our vet's control, she is coming up with her own medical treatment that she wants [for] the girls." "Like I said: Rosie and Opal are excited to be back to be with their friends and their family."